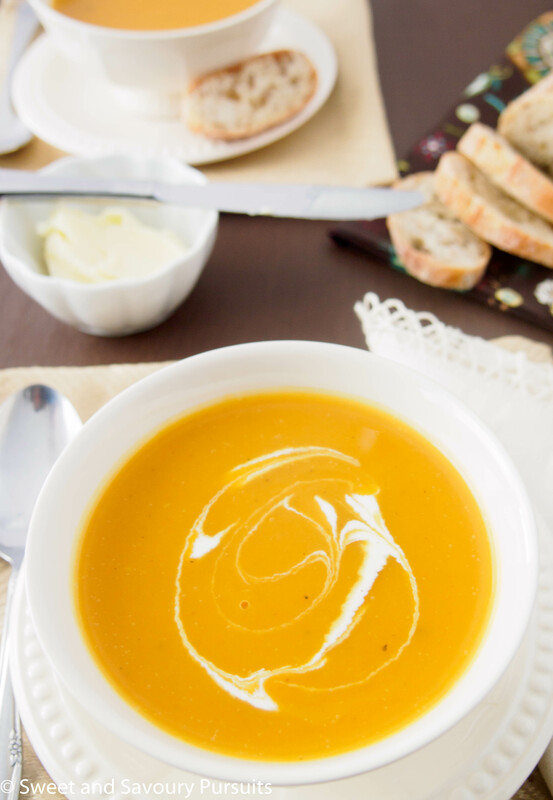 This delicious, healthy and easy to make Roasted Butternut Squash and Pear Soup is silky and creamy without the addition of any cream. Happy New Year everyone! I thought I would start off 2015 by posting something healthy on my blog. Since it’s so cold outside, I wanted something hot that would warm me up, so I decided on making this Roasted Butternut Squash and Pear Soup. I just love the bright colour of this soup and how smooth and creamy it is. 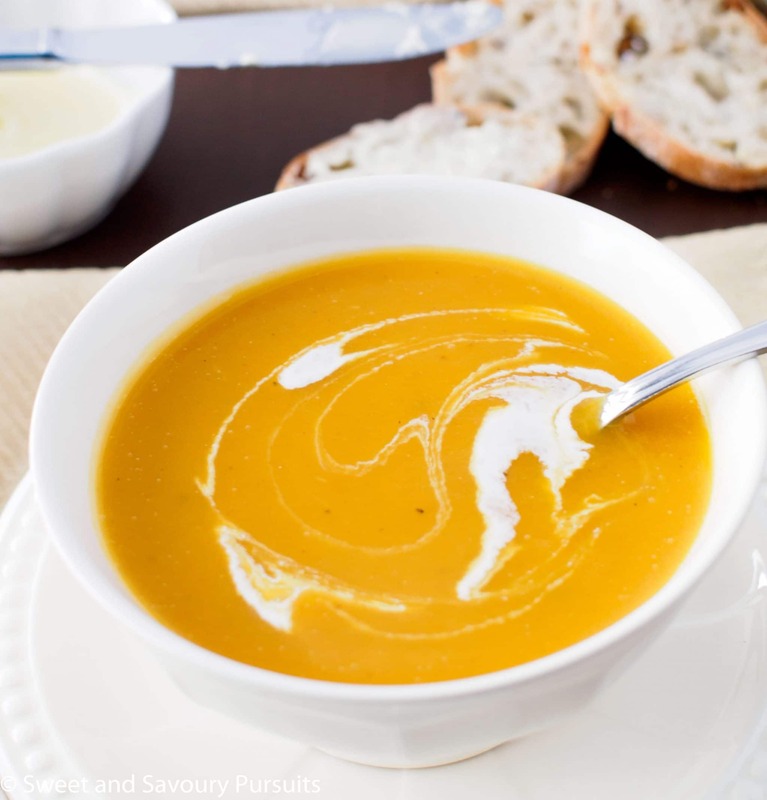 For this soup, I decided to roast the butternut squash, this eliminates the need to peel and dice the squash, and I find it also brings out it’s sweet flavour. I like to purée this soup, but you can choose to leave it chunky or you can purée part of it and leave some of it in chunks, it’s really a matter of taste. This soup tends to thicken quite a bit once refrigerated, but you can easily thin it down by adding more chicken broth or water when you reheat it. Wash the butternut squash and cut in half lengthwise. Using a spoon remove the seeds and stringy flesh from each half and rub the flesh with olive oil. Place the squash cut side up and bake in the oven for approximately 45 minutes or until the flesh of the squash can easily be pierced with the tip of your knife. Remove the squash from the oven and let cool for a few minutes. Scoop the flesh out of each half and reserve. While the squash is roasting, wash and chop all vegetables and pear. Heat the oil and the butter together in a large saucepan over medium heat. Add the onions, garlic, jalapeno, celery and carrot and cook stirring a few times until they soften, about a couple of minutes. Add the fresh thyme, ginger, coriander, nutmeg, salt and pepper. Add the flesh of the roasted butternut squash and the pear and stir. Add the chicken (or vegetable) broth and let the soup come to a boil. Lower the heat to medium and let the soup simmer for about 20-25 minutes. Remove the little branch part of the sprigs of thyme and using an immersion blender, purée the soup. If you don’t have an immersion blender you can also transfer the soup in batches to a blender or food processor and purée until smooth. Pour the soup back into the pot and if desired you can adjust the consistency of the soup with more broth or water. Butternut squash goes so well with so many spices, it was delicious. Beautiful soup and nice pictures! I love the idea of roasting the squash and not peeling it! 🙂 It sounds like a delicious soup! Thanks Nancy, I find it much simpler to roast the squash than to peel and chop it 🙂 Plus it’s delicious roasted. Thank you Moya. Happy New Year to you too. Thank You 🙂 Butternut squash is my favourite squash to cook with. Happy New Year to you too! yum this looks delicious! I will try it! Thank you so much Kaila 🙂 I hope you’ll enjoy it.